Do you know how your child is being educated and does it matter? If I were to choose another school for my children top on my list of questions would be 'how are my children going to be educated'. It's important don't you think? I'm surprised by the amount of people that don't know how their children are being taught. I spent the evening at our school speaking to Cycle Two teachers and having a look through a Cycle Two classroom. To say I understand Montessori isn't enough. To say I understand the next plane of development isn't enough. There is a big difference between each cycle and to be honest I'm still getting my head around Cycle Two (6-9yrs). So to sit down and see and hear how my children will be taught long division is important to me. Also I find Montessori math materials intimidating so a tour of the maths section was always going to be helpful. I know we don't all have a choice as to which school our children attend. However we all have choice about how much we as parents as guardians of our children know about how they are taught. Another thing that struck me tonight was how integral community is to a child's learning. We've heard the saying 'it takes a village to raise a child' well it also takes a village to educate a child. Certainly when Caspar started school I didn't know my 'village', although I felt I was looking I couldn't find that community that would help me educate my child. I think it just takes time. I'm starting to get to know that village and I'm feeling more comfortable here. For no teacher works alone. No parent should work in isolation either. I was recently asked about early numeracy activities. While I don't feel that we do or that I put out a lot of numeracy activities it was quite easy to put together a list of five. These five really encompass the numeracy activities that we do at 27 months as part of our everyday living. These activities are as hands on as possible keeping in mind that workbook, worksheet activities don't form a part of the Montessori approach at this age. Counting oranges as we put them into the bowl. Counting apples at the store as we place them into our basket. Counting pegs as we put them on the line. Above Caspar is singing Five Little Monkeys to Otis. Other favourites include 1,2,3,4,5 Once I Caught a Fish Alive, Five Little Ducks Went Out One Day and Ten in the Bed (or Three in the Bed). There are a couple of excellent number and counting materials/toys available. We love the above TAG Tumble Down Counting Pegs. I also really like the 1 to 5 RIng Counter. As the child uses these toys they start associating the number or pegs/rings with the written number. As well as increasing body awareness we find counting body parts fun. Perhaps because Otis and many toddlers are ticklish and very interested in their own bodies. Otis will often (if given the opportunity) count the fingers and toes of others. We love the Waterhole by Graeme Base and Montessori Number Work by Bobby and June George. Even the Very Hungry Caterpillar has a fun counting component. There is also the Montessori Blue Number Counting Book and I also like One Gorilla A Counting Book by Anthony Browne. I'm sure there are many other excellent counting books that are also beautiful and fun to use. "Reciting one, two, three, four, five, and so on, is fun for a child, but it is not really learning math. Math starts with the excitement of moving and touching real objects, gathering them into groups, counting each one, one at a time. It is exciting to discover that these words stand for quantities of like objects - buttons, peas, spoons, family members, stars in the sky - and later to realize that these concepts are used and understood all over the world." - Susan Mayclin Stephenson. The Joyful Child. Montessori, Global Wisdom for Birth to Three. Montessori in the home. The only two books you'll ever need. I have made a lot of book recommendations over the years but these two books (both released this year) have changed everything. You can see my favourite Montessori books listed on the bottom of this page. We don't home-school, I believe we live Montessori rather than it being something we teach. These two books are similar in that they are not homeschooling books, or teaching albums. They are about living, having children in the home the Montessori way. Creating environments that support children to reach their full potential. Meeting the developmental needs of the child. However if you home-school or even are trained in Montessori these books will still please you! I have already written in some detail about Child of the World (for the 3-12+ age group). The most recent book The Joyful Child is for the birth to three age group and is as equally delightful. It's the book that has been missing. It's the book that I have been waiting for. It is the book that I will recommend every time someone asks "I have a infant/baby/toddler and want to know more about Montessori, where do I start?". You start with this book! Want to know how to prepare your home in a Montessori way before the birth of your child, need ideas for activities about art, people, language? Want lots of tips and ideas for materials and toys for each stage in development. 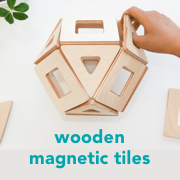 Want detailed information on how to wean the Montessori way? In The Joyful Child Susan addresses all of this and more. It's a really lovely, reassuring and inspiring book. The Joyful Child contains lots of little (black and white) photographs that are not only very cute but also provide ideas. Susan who is a very well travelled and well respected Montessorian also writes about her wonderful experiences in Bhutan. Does a more glorious book exist? If you have a child under three, or planning to have a child under three I suggest you obtain a copy of The Joyful Child. It's really the only book you'll need. Available from Michael Olaf, Amazon and the Book Depository. To brighten things up a little we decided to print on some of our plain napkins. A bit like our Inside Outside Fruit prints! We've had these fabric paints for years and they are worth the initial investment. It's not that they are terribly expensive but if you want them in lots of colours it adds up. With our Inside Outside Fruit we used paint stamps because it's important to get an even(ish) thin layer of paint on the fruit. This time Otis did lots of simple sploshing but Caspar used the roller to get even coverage. When the prints were dry I set them with heat on the reverse side. The colours changed slighly, they are not so bright anymore but still very pretty. Best of all they are uniquely ours. I'm going to keep this little space in the study for themed baskets. I'm planning on leaving the basket there for as long as the children are interested in it. I don't have any expectations, perhaps a week, a month, six months? It will be a good way of using some of the materials not on our shelves and it might lead to some focused learning. We are starting with a cultural basket. There are so many options to extend this. Lets see where it goes. It's the first time we have kept a globe where Otis can reach it. He loves and is fascinated by globes, wanting to carry them. This basket includes a children's atlas, book and a memory game featuring flags of the world and books about children from different cultures. I have found that children are often interested in different cultures from a child's perspective. I also feel less is better, at least to begin with. The children can always add to the basket. Inspired by Mariah's Bird Watching Basket and other nooks. This is quite separate from Caspar's research work which is very individual and kept where Otis cannot access it. This is more a basket of exploration for both children and possibly something they can explore together. We have previously kept the world map about Caspar's desk. I think we'll find a permanent position where it is available for all to see and use. Have you tried creating a nook or themed basket for your children? I'd love to hear about it and which themes your children enjoyed the most. I want to share with you some notes that I have made as I have been reading about Montessori, toddlers and books. All families I know treasure books. Every parent I know reads to their child/ren. So what's so different about the Montessori approach? Have the child hold and handle books from an early age. If the child is sitting in your lap have them hold the book or turn the pages. Ensure the child knows and understands where books are kept and is able to put them back after use. Demonstrate how to turn the pages carefully from the top right corner. Store books at the child's height in a front facing bookshelf, displays or in baskets. Toddlers are not able to associate a book by it's spine so it's best to store them where the child can easily see the cover. Provide books based on reality. Montessori wasn't against fiction but believed fairy-tales and the like are best suited to older children. Toddlers are trying to make sense of the world and are often most interested in the world around them, animals, the environment and everyday activities. Offer books that demonstrate diversity, show different cultures and different lands. Provide comfortable reading spaces throughout the home environment. A reading corner with a few cushions can be provided in the living area as well as the bedroom or garden. Do not interrupt a child reading (unless they are mistreating the book or are in danger). A child can build and exercise their concentration just by reading/looking at books. Quality not quantity. A few well chosen books are best. If the child has access to a large number of books they can be difficult to store and care for - try rotating books but keep favourites available at all times. Source reference books with clear pictures of objects or animals for the child to name (try books that show the image with a white or plain background so the child can easily distinguish the object). It's not necessary to read the story every time. With an older toddler try talk about the story, what is going on in the picture. Build anticipation - what will happen next? Accept the child's choice, allow the child choose a book to read without enforcing your preferences. Ensure the child is exposed to family and friends reading for their own pleasure. Remember toddlers will imitate and absorb all that is around them! Otis uses a knife every single day. Without fail. Many times a day. He's definitely at the "me do it" stage. He has access to all of his knives now. To begin with I kept most of them out of his reach but over time as his skill level increased and he has acted responsibly we have kept his knives in his kitchen cupboard. Now he chooses which knife he would like to use or it's likely he picks up the first one he sees. But of course, it wasn't always like that. Otis was introduced to a knife in his first weaning set (as seen in this post), as soon as he could sit at the table he had correct cutlery. He has and still on occasion uses this knife to cut soft foods, it's dull - there is no possible way he could cut himself and most of all it's small - easy for him to hold and manipulate. A knife like this or a small butter knife is a great first knife and it's a good idea to start cutting with soft foods such as the banana. As he got older Otis wanted to help prepare harder foods like apple, carrot, celery, pumpkin and potato. At seventeen months he started using knife 1 and 2. Knife 1 is my absolute favourite, it works really well for those tiny hands and Otis got a lot of joy out of being able to use it at such a young age. Best of all both of these two knives require strength and if demonstrated and used with the pressure being applied at the top with both hands on the handle, there is no risk of injury to the child. With these harder foods I still cut them first so that they sit flat on the cutting board and won't roll or move while being cut by the child. These knives are also great for making vegetable chips - at any age. You can also see Otis using knife 1 as he often does, to cut banana bread here. A knife like 3 is a good first serrated knife. This is actually a serrated spreader. Because the tip is round a child can learn to cut using the serrations will little risk to their fingers. Once again the demonstration of this knife is key. I have seen spreaders like this used in many Montessori environments from toddlers up. I have also seen these spreaders in two sizes, a very small one which fits perfectly in a toddler's hand (around 10cm) and a slightly larger one (around 19cm) which helps when cutting larger foods. Knives 4 and 6 are similar in that they are sharp serrated knives with a rounded tip. The rounded tip provides some safety to the child's supporting hand. In more recent times, since Otis has turned two, he has been able to use knife 5 and 7. Knife 5 is a small cleaver, it's not super sharp but will cut through hard foods. Knife 7 is a serrated paring knife and is sharp. Otis has cut himself with this knife twice, never to become distressed or draw blood but he has cut his skin. I like this knife because the child (still a toddler!) learns to use a sharp knife (which is genuine, useful and honest) and it is small enough to be controlled by their small hands. This is where we are today. Here is a post showing Caspar cutting many years ago - Kids Cutting. This is a lovely post from Montessori on the Double Cutting with a knife and other kitchen activities. I have sourced our knives locally in Australia at local kitchen stores, all except knife 5. which I purchased from Michael Olaf. Knives are as follows (with o/s links): 1. Wavy Chopper, 2. Wavy Vegetable Slicer, 3. Similar Spreader, 4. Blunt Tipped Serrated Knife, 5. Tiny Cleaver, 6. Round Tip Serrated Knife and 7.Sharp Serrated Paring Knife. Do not tell them how to do it. Do not tell them how to do it. Show them how to do it and do not say a word. If you tell them they will watch your lips move. If you show them, they will want to do it themselves. - Maria Montessori. 1. Transferring peas with a spoon, 2. Transferring beans with fish bone tweezers, 3. Transferring beans with jugs, 4. Transferring water with a sponge, 5. Transferring water with a dropper, 6. Transferring water with a baster. Pitchers, spoons, tongs, tweezers, chop sticks, sponges, basters, droppers, water, beans, peas - all easy to find materials. I love transferring activities because the level of engagement is high. Otis may only do the activity or one full transfer once, but during that time he is totally engaged. This level of concentration brings peace, some serenity to this boisterous toddler, a moment of calm. He is using his hands, his arms, his strength and coordination to have control over his environment, to demonstrate his will. Carrying the tray to the table provides an opportunity for the child to use balance and strength of the larger muscles. Cleaning up inevitable spills provides an opportunity to mop, sweep or sponge - care for the environment. This isn't play, it is is work, it is work which contributes to his development, to the formation of his soul. Not only building physical strength but strength of mind also. I have never taken Otis to a Child and Maternal Health Nurse. He came home from hospital the same day he was born. A nurse visited two days later to check on and weigh him. That was the last time he was weighed. If I were concerned about an area of his development obviously I would seek professional advice, but so far so good. After being a huge worrier with Caspar (my first child) looking at percentiles and reading where he 'should be' I know it doesn't help at all. I think the only time I started to feel concerned with Otis was with crawling and walking, while I knew he was within a normal range I became impatient waiting for these milestones. At 27 months what is Otis doing? As Caspar has speech pathology, speech is one area I have a particular interest in. I have read that by this age the child should be able to say 50 words. Otis can say much more than this so I'm not counting. He is clear and easily understood by others. He knows his name and the names of people around him including teachers, Caspar's friends and their mum's names. I feel his comprehension is good, he has an awareness of today, tomorrow, morning, night. He can follow commands with two or more steps and knows up, down, forwards, backwards, over, under, on, off. He uses his name and will also use I, me, my, mine. He also uses the possessive terms of Otis's, Caspar's, Mummy's and Daddy's. He can visually recognise his own name and Caspar's name. Otis brushes his own teeth but we check go over them once he has finished. Otis feeds himself and often prepares his own snack and tells us which foods he would like to eat (usually pizza and pasta). He can put his underwear and pant on himself, although often he puts two feet/legs in the same hole! He can also put his shoes (velcro) and socks on by himself, although he often gets frustrated and will ask for help on the second shoe. He is toilet trained day and night, although still has 'accidents'. This requires patience and I'm not entirely sure why they occur, sometimes he is somewhere new but sometimes at home too. Otis enjoys sorting, matching and sequencing. He loves to sing and knows words and actions to songs. He has good anticipation and will often finish my sentences in well known books or songs. He understands big and small. He loves imitation and will often pretend play as a garbage truck, courier or pretend to talk to someone on the telephone. He will often imitate his brother drawing or working at his desk. He understands basic actions and consequences. His attention span varies greatly. He loves books, can follow and answer questions about a story line. Otis has really good hand-eye coordination, he enjoys puzzles, threading, building and can confidently use scissors. He can confidently throw and kick a ball. So not good with catching. He can jump with both feet together. He loves his trike, will use but not often his balance bike. He will scoot around on the tricycle with pedals but does not use the pedals. He can turn the pages of a book one at a time but not always. Otis is in that very painful stage of only sometimes needing a daytime nap. It's about 50/50 right now. On the days he has a daytime nap it's usually for around 40 minutes. If he has had a daytime nap it takes much longer for him to fall asleep and it's often much later in the evening. Otis is becoming more independent when falling asleep. He is recognising and using words when he is tired. If he hasn't had a daytime nap it usually takes 5-10 minutes after a story for him to fall asleep, or sometimes we read until he is asleep. Otis is still at the age where he will play alongside other children. He has learnt to take turns or wait until another child has finished using a toy through school. At home there is less sharing however Caspar is old enough that he can manage the situation. I believe Caspar's ability to manage not only snatching but also interrupting or poor behaviour stems from school. Caspar has (on most occasions) the right words to ask Otis to wait or take turns. Otis is physically intimidated by other children even those much younger than him, to avoid confrontation he will usually retreat. Being a second child I believe I worry less about development because I know how different children can be and I know a little more about what to expect. I believe that Otis is much more advanced in many areas (compared to Caspar) because he has a brother (whose skills are not that far removed from his own) to observe and imitate. 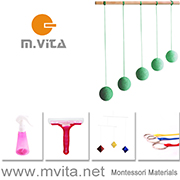 Recently I had the opportunity to speak to two Australian Montessori suppliers and see some of their new infant/toddler materials. All of these materials except the bells are by Gonzagarredi. While these materials are made specifically for a school/community environment I think there is plenty of DIY inspiration. The bells however were in my price range (and I have them on backorder). I love the adaption of the bells for toddlers. The Screw/Unscrew is really clever and the fabric box is genius. Beautiful. Imbucare Box with Different Cylinders, Montessori Toddler Bells, Coloured Cylinders on a Tray - Set 1, Screw/Unscrew, Concentric Cylinders on a Tray, Imbucare Board with Discs, Cubes Spheres Prisms on Coloured Dowels, Fabric Roll Box. A short post about an activity I introduced to Otis (and Caspar) today. For an older child (such as Caspar) I would take the batteries out completely but I know Otis will get there eventually. I think they like it because the result is the light, that they can make the torch work. It's a nice reward. It's also a nice introduction to how things work, that the energy source is the battery, without the battery the torch won't work. A great hands on approach to learning. I first saw this activity in The Making of Great Little People. In a classroom setting they had a space marked on the wall (perhaps it was on a door?) where the students could shine the torch, this prevented the child from waving it around and/or distracting the other students.